In honor of Valentine's Day, POM Wonderful is hosting a cupcake contest. Since February is American Heart Month, POM Wonderful is donating $1 per entry to the American Heart Association. The key is to come up with a tasty cupcake recipe featuring a POM Wonderful product, and my entry is a rich and delectable POM Wonderful Molten Chocolate Cupcakes with Caramelized POM Ganache. The POM juice accents the batter and the ganache, giving the chocolate a lightly tart and fruity undertones. It's pretty intense. There are three awesome prizes being given away, and I'd love to be able to snag one of them. To help, simply click the POM badge on the sidebar. You'll be taken to my recipe on the POM contest site where you can hit the Facebook "Like" button to vote. You could also share the link on your Facebook and ask your friends and relations to vote, too! Voting begins today, February 14th, and runs through February 28th. Voting opens 11:00 a.m. PST, today. First, I prepared the caramelized ganache. 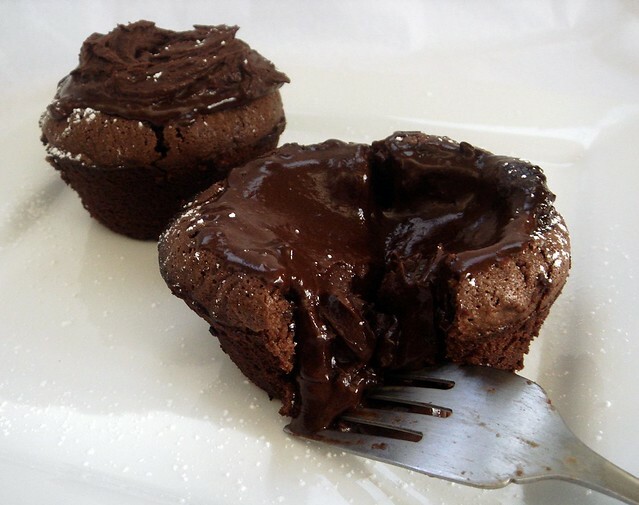 This makes up the gooey center of the cupcakes as well as being the finishing touch, a dollop of whipped ganache on top. Decadent, to state the obvious. I began by heating up whipping cream with POM juice. 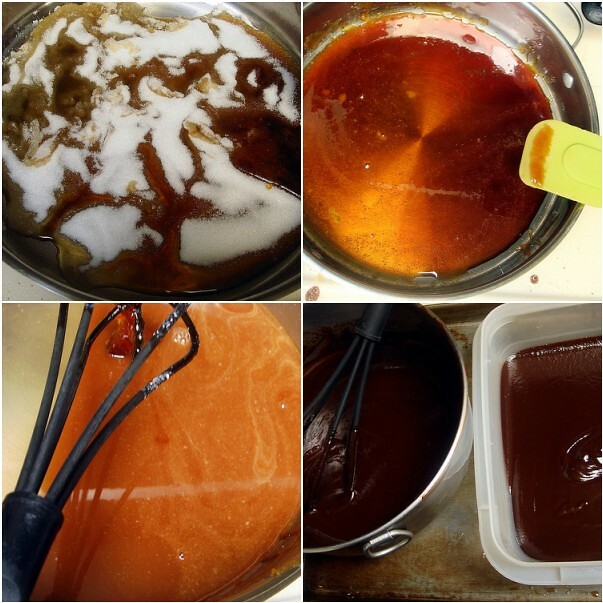 In a separate skillet I caramelized some sugar until a deep golden color was achieved. After that was ready, I poured some of the heated whipping cream-POM mixture in, whisking vigorously to make a caramel sauce. Off the heat, I added the rest and stirred until combined. You then pour the caramel sauce over the chocolate, let stand for a minute, then whisk until all the chocolate is melted and a smooth consistency resulted. Portion the ganache and refrigerate some to harden, letting the rest cool to room temperature. The batter for the cakes comes together quickly, as the recipe works like a brownie. The butter is melted with the chocolate, eggs, POM juice, vanilla extract, and confectioners' sugar is stirred in, then finally the flour. I let the batter sit at room temperature for about an hour. Before baking the cupcakes, I rolled out tablespoonfuls of ganache to prepare the for the center. 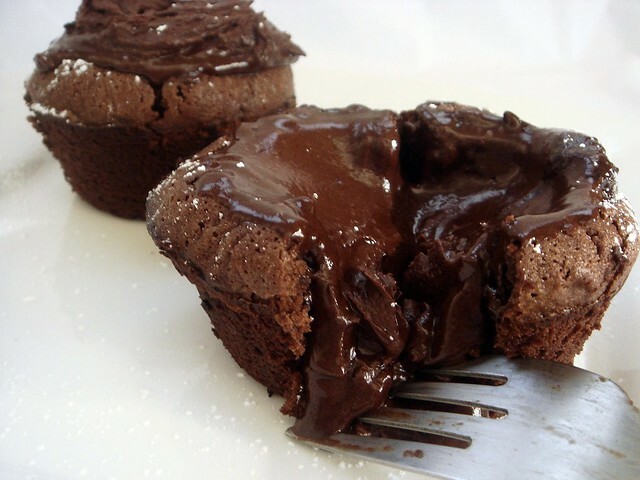 The batter is divided between well-greased muffin tin cups, then a ball of ganache gets placed on top. Don't press all the way down, just slightly. A quick 13 minutes in the oven is all that's necessary for the cupcakes to cook. You don't have to worry about overbaking these since the ganache softens from the heat to achieve the gooey center. Very simple. After cooling for a few minutes in the tins, the cupcakes are carefully removed and set on plates. Dollop with the remaining ganache, which has been whipped, and the cakes are dusted with confectioners' sugar to finish. Thanks for your support in voting! I really appreciate it. Place chocolate chips and unsweetened chocolate in a large bowl. Heat whipping cream and 2/3 cup POM juice to a simmer in a small pot. Keep warm. In a large skillet over medium heat, sprinkle sugar evenly over surface. Allow sugar to melt and caramelize, 7-10 minutes. Stir sugar only when most of the sugar begins to caramelize. Standing back from skillet, pour 1/2 cup heated whipping cream mixture into caramel, whisking vigorously. Stir in remaining whipping cream mixture and continue stirring until combined. If there are any lumps, discard. Pour over chocolate and let stand for a minute. Whisk until chocolate is melted and a smooth, dark ganache is achieved. Measure out 1 1/4 cup ganache and place in a shallow dish. Chill until solid. Let remaining ganache cool to room temperature. Add 2 tablespoons POM juice and whip with an electric mixer until lightened in color, 3-4 minutes. Set aside. Preheat oven to 425 degrees. Grease 16 standard muffin cups well. In a large, microwavable bowl, melt butter and chocolate on high for 1-2 minutes, until butter melts. Stir until chocolate melts. In a medium bowl, whisk eggs to break up yolks. Stir in POM juice and vanilla. Add to chocolate mixture and whisk to combine. Whisk in confectioners' sugar and sea salt. Stir in flour just until combined. Let batter sit at room temperature for 30 minutes to 1 hour. Meanwhile, portion chilled ganache into 1 tablespoon-sized balls. Fill muffin cups 2/3 full with batter. Place a ganache ball on top and press in lightly. Bake for 13 minutes. 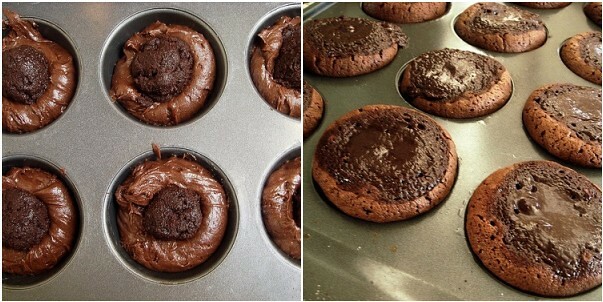 Sides of cupcake should feel firm when pressed. Cool in tins for 7 minutes. Using an offset spatula, carefully remove cupcakes from tin and place on a cooling rack. To serve, place a cupcake on a plate. Dollop with 1 1/2 - 2 tablespoons whipped ganache. Lightly dust with confectioners' sugar. Enjoy! Ganache can be made a day ahead of time. Divide portions, then cover and refrigerate. Heat ganache for topping in a metal bowl set over a pot of simmering water just until ganache melts enough to whisk easily. Let cool, then whip. Batter can be portioned into muffin tins and refrigerated overnight, covered. Remove from fridge and let sit for 30 minutes while oven heats to room temperature. Top with ganache balls and bake. It may need an additional 2-3 minutes. I'm off to scour my kitchen for chocolate. You have triggered a major craving!!! Dee-lish. The cupcakes look incredible! I hope you win! Micki - What's in it for me, dishwasher? Sues - Ha, I wasn't sure what to name it, so I ended up picking the most verbose title. Jess - I like your enthusiasm!